its type-A connectors and the charger's internal circuitry were never designed with 3A in mind. 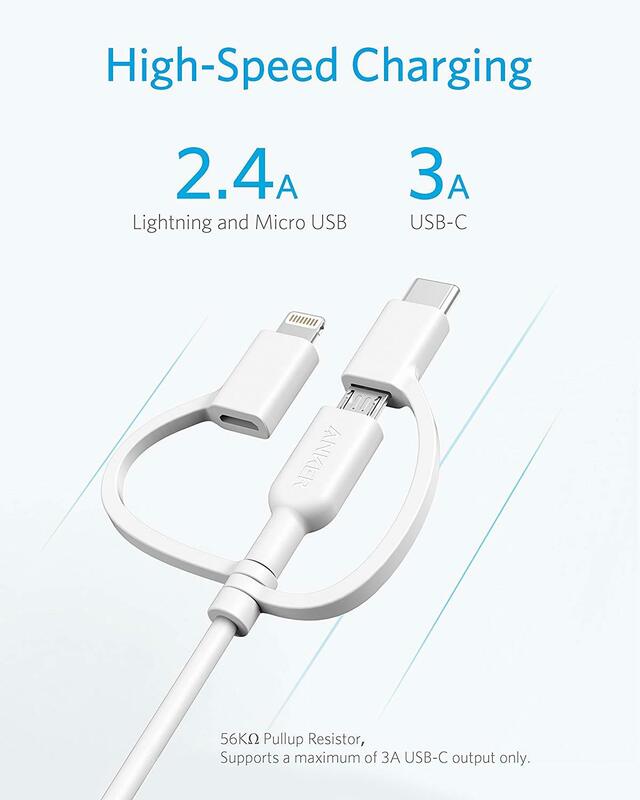 That's why essentially all USB chargers before type-C were limited to 2.4A. Yes, we are planning on it! That cable does have a 56k ohm resistor so the OnePlus phone + Dash cable can not pull 4A except when plugged into the Dash Charger (whose circuitry can deliver 4A per port). That's what I'm getting at, right? The resistor is the key. Ah, thank you for the reply. Interestingly, Anker has told me this cable does have a 56k ohm resistor..which would mean it is limited to 2.4A on type-C, no? Not the 3A as stated on Amazon? I understand your concerns. Please be advised PowerLine II 3-in-1 Cable comes with the needed 56k ohm resistor for all legacy type-A to type-C cables. The OnePlus type-C to type-A uses a 10k resistor? Do you have a link handy to confirm that or? The teardown I found above states a 56k ohm resistor, which makes the most sense. I agree with nigelhealy: his FAQ is the same FAQ I linked to You do need the 56k ohm resistor in almost every case. The only situation you would not: every type-A port you will ever encounter is a OnePlus Dash charger. Otherwise, you--to quote nigel--"risk frying your charger." The chargers can't support the 3A. Using your bad USB cable, I have personally seen a high quality Anker charger in a brown out cycle continuously until I unplugged your cable and my Type C device charging from it. But, Anker has confirmed the 56k ohm resistor. Whew. I will followup about how exactly they got 3A via type-C with a 56k ohm resistor, but I'll chalk it up to a marketing mistake for now. Any news when this powerline II 3-In-1 cable will become available in black and in 6'?